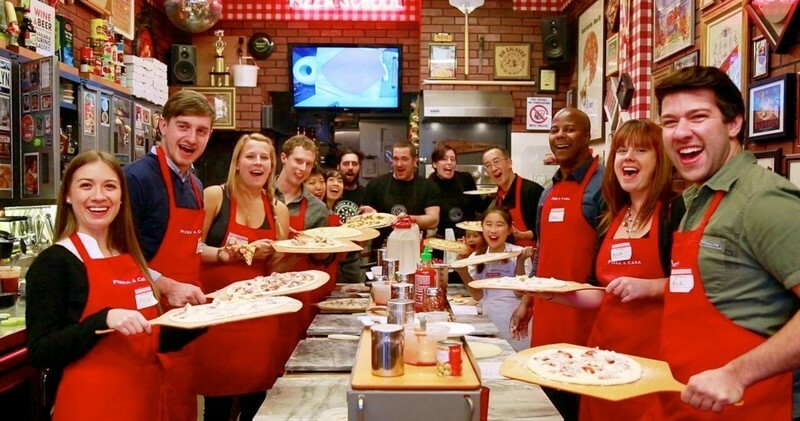 Our HANDS-ON PIZZA WORKSHOP is perfect for both beginners and practicing pizza-makers. • In this 4-hour workshop, we’ll take you step-by-step through the entire process of crafting incredible pizza from scratch. • Tickets are $195 per individual or $295 for two people working as a team. • Friends, families and couples are all welcome to attend. ★ perfect dough — made by YOU. ★ the secrets of the sauce — better than store bought and at a fraction of the cost. ★ stretching techniques for forming the perfect crust — and how to throw dough like a pro. ★ all about ingredients — where to source them and proper balance, order and proportions when applying toppings. ★ getting the most out of your home oven — plus pizzeria and wood fired oven wisdom. ★ fresh mozzarella from DiPalo’s — NYC’s iconic Italian food shop, family owned and operated for over 100 years. ★ what to look for in tomatoes for sauce making and demystifying supermarket varieties versus San Marzanos. ★ an amazing array of ingredients for meat-lovers and vegetarians alike. ★ pizzas made by our expert instructors ranging from the classics to some unexpected and unforgettable combos. ★ up to 4 pizzas made by YOU — with your new skills your favorite pizzeria may start wondering where you've gone! ★ All students receive our exclusive booklet Make Perfect Pizza at Home. ★ Fine wines, craft beers and specialty sodas are available for purchase. ★ Pizza boxes are provided for leftovers, and containers for extra dough. ★ Post pizza-class support via email and our Dough Emergency Hotline. ★ Alumni access to our in-store and online pizza gear shop.